This entry was posted on April 13, 2018 by MAV Europe. 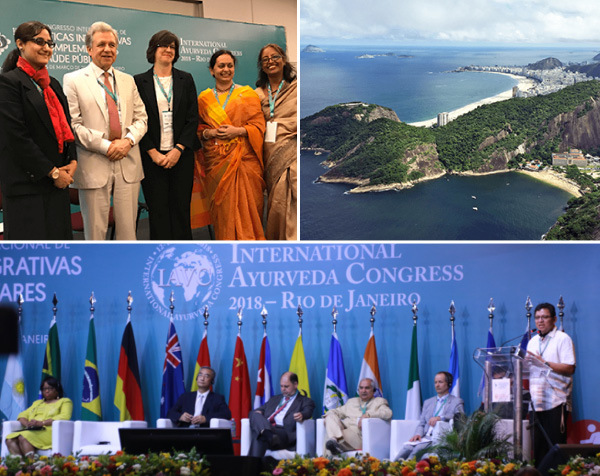 The third International Ayurveda Congress took place in Rio de Janeiro from 12-15 March 2018 – this time, together with the “First International Congress of Complementary and Integrative Medicine and Public Health”. The Brazilian government invited specialists and the general public to this Congress and also financially supported it. This allowed the more than 4,000 participants to attend, free of charge, the one-of-a-kind program featuring leading international speakers and exciting topics from the fields of Ayurveda and complementary medicine. Over 10 parallel sessions took place every day. The presence of high-ranking government representatives, including the minister of health, showed the Brazilian government’s openness and interest in integrating traditional and cost-efficient therapies such as Ayurveda into Brazil’s national health care system. In the end, a resolution was passed suggesting that some 30 different naturopathic treatments – including Ayurveda – be equated with modern medicine and covered by medical insurance. We at Maharishi Ayurveda hope that the efforts made for this to happen continue to be successful and that more people all over the world can benefit from the wonderful knowledge of Ayurveda.